Though Italian composer Andrea Guerra has been composing for 20 years, his work may not be instantly recognizable to American audiences, as up until recently, the majority of his films have been Italian, though his more well-known credits include high-profile awards movies: Hotel Rwanda, The Pursuit of Happyness, and most recently Nine. With the upcoming Letters to Juliet and his latest, Extraordinary Measures, it appears as though Guerra is finding a nice niche for himself in Hollywood. Extraordinary Measures, directed by Tom Vaughan (What Happens In Vegas), tells the story of John Crowley (Brendan Fraser), a business man who discovers that two of his children have been diagnosed with a fatal disease and sets out to develop a cure, along with the aide of an aging scientist (Harrison Ford). The film has all the “inspired by a true story” kitsch involving hope and miracles, and in 16 songs and 35 minutes, as Guerra’s composition plays out, the bouncy rhythms of his score, especially the title track, seek to drive home the film’s tagline: “Don’t hope for a miracle. Make one.” But as the drama unfolds, unfolds again, and then unfolds a bit further, Guerra’s heavily emotional score feels a bit heavy for music with such light themes. There seems to be a recurring theme of struggle and hope, always with a slightly optimistic edge. At its most subtle, this theme is enjoyable, but other times, such as towards the end of the album, about 30 seconds into the track “I Didn’t Do It For You,” when the tune kicks into high gear. Bouncing along, this overtly sweet tempo carries over into the aptly name “Sugar High” where it is sustained for a good minute before carefully fading into softer, simpler strummed harp notes and delicately tapped piano. Other heavier pieces such as “Call From Hospital” feel unfortunately artificial, with a driving rhythm backing up more light strings. Guerra has worked on other “true story” dramas in the past, and with much better success – whether this is based on the stories behind the films or the directing choices is unclear, but Extraordinary Measures feels a bit forced as a movie, and Guerra’s score can’t hide from that general vibe of sugary artifice. 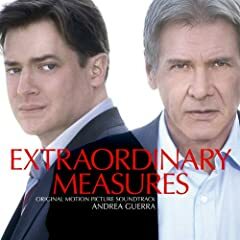 No user commented in " Music Review: Extraordinary Measures Original Motion Picture Soundtrack, by Andrea Guerra "